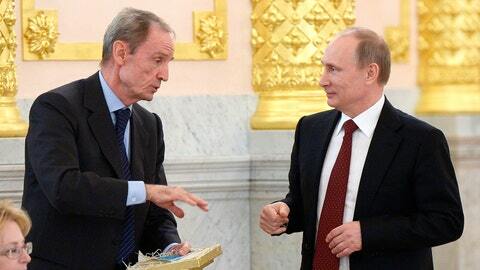 Russian President Vladimir Putin, right, listens to Chairman of the IOC Coordination Commission for Sochi 2014 Jean-Claude Killy during a Council of Physical Fitness and Sports in the Kremlin on March 24 in Moscow. French ski great Jean-Claude Killy has resigned as a member of the International Olympic Committee, declaring it’s time to move on after spending the past seven years heading the oversight panel for the Winter Games in Sochi. The 70-year-old Killy said he completed his mission of helping deliver successful Olympics in Russia and defended his close working relationship with President Vladimir Putin, calling him "a good man." Winner of three gold medals at the 1968 Grenoble Olympics, Killy is leaving the IOC after 19 years as a member. While he could have remained until the age of 80, he said months ago he planned to step down after Sochi. Killy, who was a co-organizer with Michel Barnier of the 1992 Winter Games in Albertville, submitted his resignation on Thursday in a letter to IOC President Thomas Bach. The IOC confirmed Killy’s resignation Friday, with Bach calling him a "sporting legend." "I’m 70-years-old. I need to move," Killy told French sports daily L’Equipe in excerpts released on Friday ahead of publication on Saturday. "I’m stopping because after Sochi, at my age, after spending seven years campaigning for Russia, it’s difficult to find something as rewarding and exciting." Killy, who became an IOC member in 1995, served under three IOC presidents — Juan Antonio Samaranch, Jacques Rogge and Bach. He was once considered a potential successor to Samaranch as IOC president, but never ran for the top job. "I’m stopping because my relationship with the Olympic world started 50 years ago when I was a skier," Killy said. "Half a century, including almost 20 years within the IOC." As chairman of the IOC coordination commission for Sochi, Killy was the main point man on the preparations for the games. He traveled to Russia more than 40 times and worked closely with Putin, who was a driving force behind the Sochi project and used the games to boost his prestige. Killy came under scrutiny for his dealings with Putin amid global criticism of Russia’s human rights record and the law banning gay "propaganda" among minors. Since the close of the Sochi Olympics last month, Russia has intervened in Ukraine and annexed the Crimean peninsula. "Did my image suffer from it (his relationship with Putin)?" Killy posed in L’Equipe. "It does not matter much. I spent seven years working in a direct relationship with a head of state running a country of 145 million inhabitants. I’m probably one of those who know him best. I’m convinced that Putin is a good man." Killy was a firm defender of Russia’s efforts to redevelop the decaying Black Sea summer resort, a massive project that required building all of the Olympic facilities from scratch. Speaking in Sochi, he said the region underwent an "astounding transformation" in the seven years since Russia secured the games. "In Europe you would probably spend 15 years on that, and here they did it in seven," Killy said. He contested the widely reported figure of $51 billion that Russia spent on the Olympics, insisting that most of the money was not for the games themselves but for rail lines, highways, tunnels and other long-term infrastructure that would benefit the area for decades. "All of the promises made in 2007 have been kept and spectacularly so," Killy said at an IOC meeting in Sochi on the eve of the opening ceremony. "It’s a new city that’s going to organize these games and show itself to the world — a city that is reflecting the new Russia." Killy replaced French member Maurice Herzog on the IOC in 1995. His resignation leaves two French IOC delegates, Guy Drut and Tony Estanguet. Killy, who also chaired the coordination commission for the 2006 Winter Olympics in Turin, lives in Switzerland along Lake Geneva. As a skier, he was best known for sweeping all three Alpine events at the Grenoble Olympics, winning gold in slalom, giant slalom and downhill. Bach paid tribute to Killy’s impact both as an athlete and an administrator. "Having already been a sporting legend as an athlete, he later dedicated himself to the IOC, its values and ideals — also with great success," Bach said in a statement. Bach said he would propose that Killy be named an honorary member at the next IOC general assembly in Monaco in December.